Google announced Project Ara to much fanfare and it caused geeks to dream of PC-like upgradability that would extend the usable life of their phones by letting them continuously swap out parts for newer, better ones. Excitement eventually collided with reality and Ara was shelved. Here’s the thing, though, modular phones were a thing long before the Phonebloks concept inspired Google-owned Motorola to start working on Ara. And the most curious thing about those phones was that they used the CF card slot to add new hardware (later the SD slot). We should fess up – this story is largely about PDAs, which weren’t strictly “phones”. But this is a story about add-ons, so the solution to this conundrum is quite simple – just plug in the phone module! But we’ll get to that. Early GPS receivers were bulky and pricey, so they were rarely built into phones. You could buy something like the Mighty GPS instead – a 20-channel SiRF III receiver. The cheaper model ($139) had no built in memory, but there was a combo card ($183) that combined GPS with 512MB memory – perfect for storing offline navigation maps (remember, mobile Internet was expensive back then, especially in roaming). Of course, expanding storage was the main use case for CF cards. But they weren’t always simple flash cards, for example, the IBM Microdrive used a tiny HDD to store data. Imagine this: tiny motor to spin up the tiny platter and another to move the tiny read/write heads, miniaturization that would make a watchmaker jealous, all to offer 1GB of storage. No, not 1TB, one gigabyte. And that’s not even the only memory you could expand via the CF slot. Toshiba was selling RAM cards! 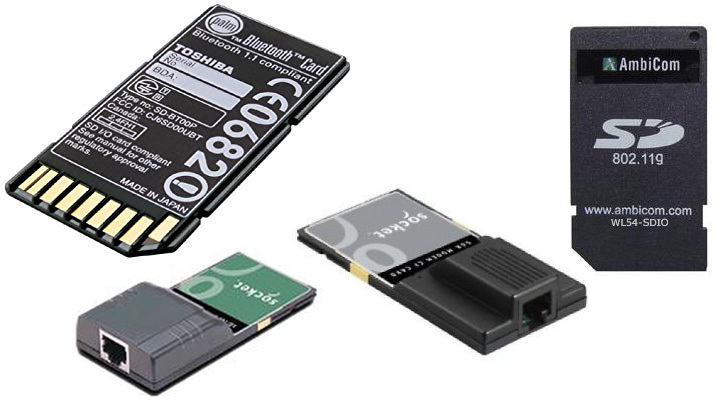 32MB, 64MB and 128MB of DRAM was available for the Toshiba E570 Pocket PC, which had 64MB of RAM built in. The card’s product page touts the advantages of having extra RAM, painting a picture of a user who has “lots of MP3s”. Laugh all you want, but when’s the last time you tried running a multitasking OS and decoding audio on a 206MHz processor with 64MB RAM? Also, that E570 had two card slots (CF and SD) while today makers are reluctant to give us even one slot. Check out this abandoned page on Toshiba.com for an extra hit of nostalgia, it's a proper time capsule. Connectivity was another area you could improve with a CF card. As Wi-Fi and Bluetooth were becoming more commonplace, you could add support for those to your trusty old PDA. But wireless connectivity was only half of the equation, an Ethernet adapter was available as well as – are you ready? - a 56K modem! What other functionality you could add through the card slot you ask? How about a camera? Check out this Sharp-made cam that could shoot 640 x 480px photos (no, no video). This HP PhotoSmart camera uses SD as its adapter and shoots 1.3MP photos. 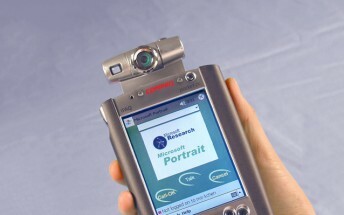 There are many more add-ons that we didn’t cover here, including GPRS modules that added 2G data connectivity to PDAs as well as voice call support. Other modules offered FM radio, VGA adapters, barcode scanners and so on. Last week's Counterclockwise also focused on memory cards, but more on the different shapes and sizes of flash cards.